Really in an ideal world it would be roasted duck, but around here finding duck to roast would be a pain–and more of an undertaking than I felt like. So roasted dark chicken meat makes a pretty good sub. 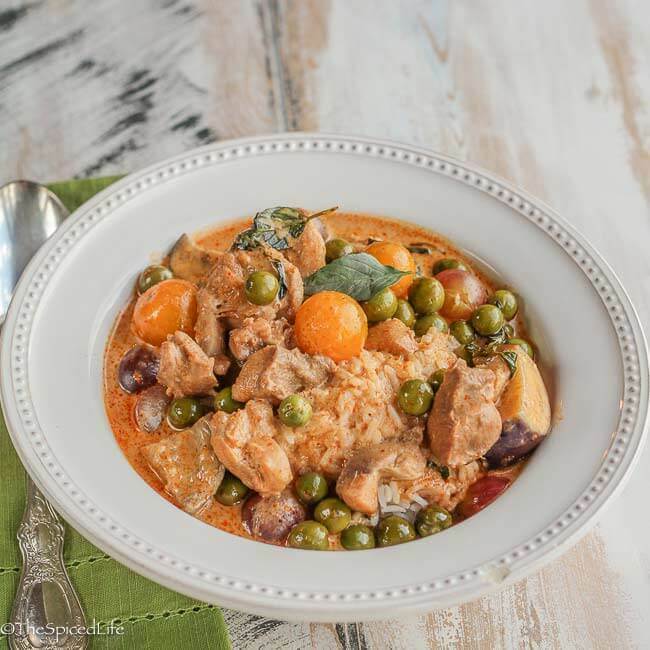 I have previously shared some recipes for and using green curry paste–which is kind of ironic because red curry paste is my first love. But as I noted in those other posts, making curry paste is usually a big endeavor, where my husband and I together make several batches to freeze. So I don’t always get around to it that often. But I was cooking for a friend of mine who just had a baby and whose husband is out of the country–he studies monkeys and is chasing them, which is only relevant because they lived together in Thailand for quite a while so they could study the monkeys there–so I knew she liked Thai food and it seemed as good of an excuse as any to finally get around to making red curry paste. I refer you back to my initial post on making Thai curry paste, here, but because red curries are based on dried chile peppers and not fresh, I do have a few other words of wisdom. 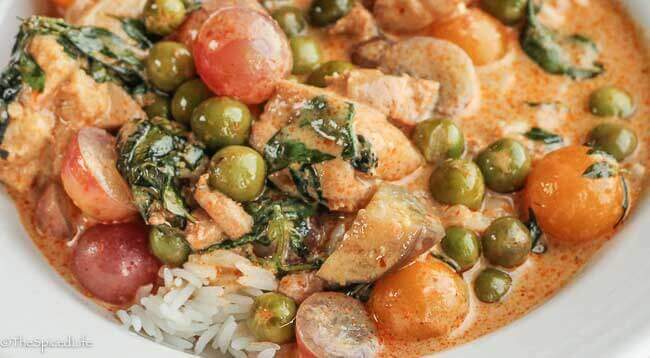 First, red curries are probably the largest and most diverse group of Thai curries. Yellow and green tend to follow predictable paths, but there are plenty of curries–such as paneng and chu chee–that you might have seen on a menu as separate from red curry, but are in fact red curries. Because of this I think of them as more flexible, as permitting more tinkering. If you like dried spices, add them. If you do not, most can be omitted, with the exception possibly of coriander seeds. The Thai of course would have opinions about what goes with what (according to David Thompson, spices like those I have incorporated go well with the oilier roasted duck, and any Thai author will tell you that chu chee is usually for seafood, even though I have enjoyed it on chicken), but I recommend you try any meat or veggie that sounds good to you. In my humble opinion, speaking as a non-Asian midwestern American who has been making Thai curries for over 15 years now (yikes!) the single greatest discovery that I have made is how to choose my chile peppers more carefully for dried chile pepper-based curry pastes. Many cookbooks recommend an absurd quantity of chile de arbol or a comparable dried chile pepper–which of course then leads to only a select number of your acquaintance being able to eat the stuff–and that is if you can even eat it! Let’s face it, when you were not raised with serious heat it can be hard to acquire the ability to tolerate it. I am a strictly medium sort of gal. (Which is, as I noted in my posts on green curry, what makes the canned curry pastes ultimately pretty useless to most of us). Anyway, then I received Victor Sodsook’s True Thai. He suggested dried New Mexico chile peppers, with some chile de arbol thrown in. What a difference! When I made paneng paste in Chiang Mai on my honeymoon, pounding out by hand yegads!, I assumed that their chilies were similar to ours, where size frequently denotes spiciness or lack thereof. Not so. My paneng, while very tasty, was also inedible. My husband finished it. But here in the New World, New Mexico, Anaheim or California chile peppers all dry to a very mild heat that packs loads of flavor. It is perfect for red curry paste. Do make sure you use a brighter (not sure how else to describe it) dried chile pepper, as opposed to the smoky darker ones such as guajillo, ancho or pasilla, all of which will taste very wrong. And certainly do not use any smoked peppers, such as chipotle. If you love Thai food like me, why not try a kaffir lime tree? You might get fruit, and even if not the leaves are the most important part. My tree loves my new house as you can see! It comes inside October/November through April/May, and all of my Thai food tastes perfect because I have the leaves! In the past I have stressed the importance of using kaffir lime peel in your curry pastes–however there has been a reduction in the world crop, leading to almost none here in the States [Happily as of November 2015 this is no longer true. Just depends on the year]. I spent an embarrassing but well worth it amount of money ordering 12 limes (I was notified when they had some available) and then carefully sectioning and freezing the peel. Temple of Thai is my most reliable source–but even they are out right now, although I recommend emailing them because it may be that the crop has rebounded and they are just not in season now. So if you cannot find the peel, I recommend half the amount of Persian lime peel (or regular limes) with 2 kaffir lime leaves shredded and added to the paste. The Persian lime peel alone will not make an adequate sub–the flavor of kaffir is like no other. 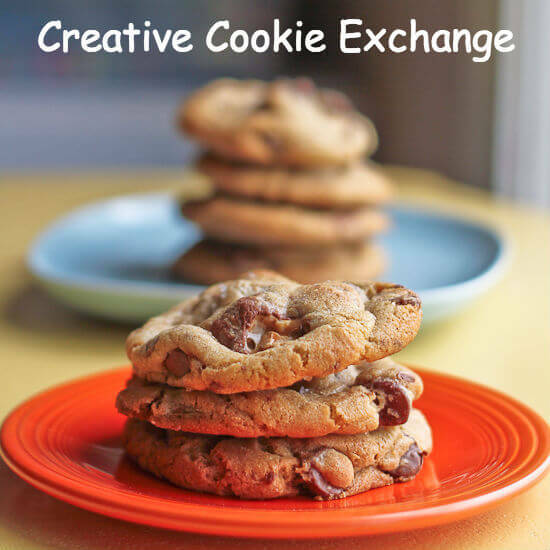 I also recommend doubling, or even tripling this recipe and freezing it. 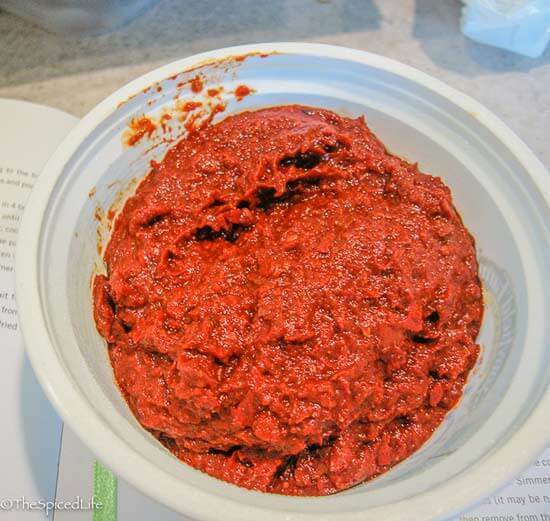 Frozen homemade curry paste is a wonderful treat–and a very easy way to really impress people. However, if you do more than double the recipe, be aware you may need to puree the paste in batches and then thoroughly mix it all together. As always, I strongly advise you to pound the woodier ingredients in a mortar first (lemongrass, galangal, kaffir lime peel/leaves, cilantro root if using–some recipes call for it but I do not here). Remove the cream from the top of the 19-oz can of coconut milk (Mae Ploy makes a good one). Heat a large pot over medium heat and add the thick coconut cream. Fry, stirring, until the oil begins to separate from the cream. Add the curry paste and fry for 5 minutes, until the oil has once again separated from the cream and it is quite fragrant, stirring frequently. Add the palm sugar (light brown sugar subs ok) and stir. Add the rest of the 19-oz can of coconut milk (reserving the 14-oz can to see if you want additional coconut milk) and fish sauce and kaffir lime leaves. Add the pineapple, sweet bell pepper and eggplant and/or summer squash. Simmer, stirring occasionally, for 5 minutes. Add the roasted shredded chicken. At this point the sauce can barely simmer for as long as you want it to, stirring occasionally. The longer the flavors have to meld the better---leftovers are always great. Before serving, check for salty and sweet (sugar and fish sauce) or more coconut milk if it sounds good to you (just coconut water to make it thinner, cream and water to make it milder) and add the basil leaves (whole) and grapes. Remove the kaffir lime leaves if desired before serving--but I leave them in so they can flavor the leftovers. Serve with jasmine rice and chopped hot green chilies in fish sauce (which you see sprinkled on the curries here) for anyone who likes more heat. Cover the seeded and de-stemmed dried chile peppers with boiling water. Set aside to soak for at least 20 minutes. Toast the whole spices and grind in a spice grinder. Toast them until they are fragrant, adding cumin, which burns easily, last. Add the nutmeg to this mix. Set aside. Place the shrimp paste in a square of foil. Fold the foil up, flattening the paste slightly,with about 3-4 layers of foil on each side. Toast the foil packet, about 5-7 minutes total, turning occasionally, until the shrimp paste is fragrant. Set aside. Very thinly slice the lemongrass. Add the lemongrass, galangal and kaffir lime peel to a large mortar and pestle and pound for about 5-7 minutes to crush and release the oils, as well as soften the woody aromatics. Remove and add to a large food processor. Pound the garlic and shallots with the coarse salt in the same mortar and pestle for a few minutes–they need less pounding. Add to the food processor. Also add the ground spices and shrimp paste. Remove the soaking chile peppers and add them to the food processor, reserving some (1/2 cup) of the liquid. Process the paste, adding some chile pepper soaking liquid (a tablespoon or 2 at a time) to loosen the paste if needed. Process the paste to a smooth consistency, scraping the sides down occasionally, but do not let the processor heat up much or it will cook the paste. In addition to its texture, one of the key ways to tell a paste is ready is by sniffing it–it should no longer smell like its individual components, but rather a whole new entity. It will smell great but quite strong–it makes my eyes water. Set aside for curry and freeze what you don’t use. It's still so interesting to me what you can get in different parts of the country…or even state. We have this one grocer by me who has the best meat/fowl selection including duck. I guess that's my way of saying "wish you were here." grapes, pineapple, squash, COCONUT MILK–all ingredients i know and love, yet i've never had them quite like this. 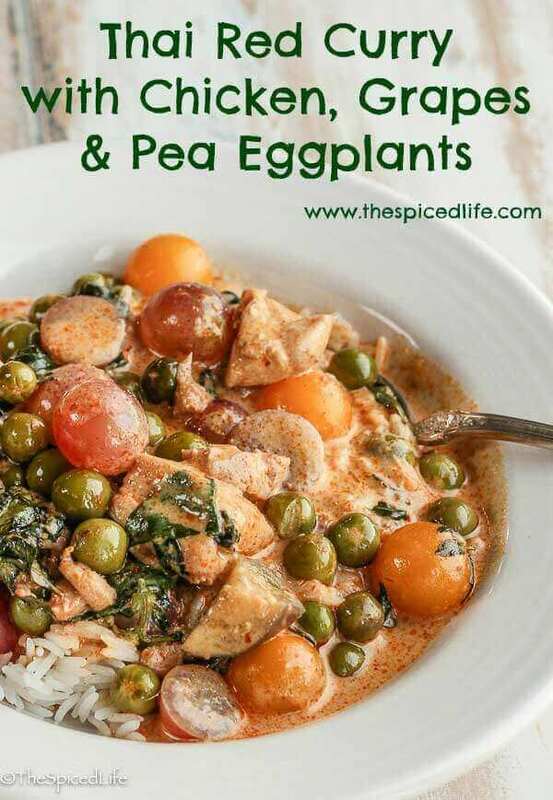 this is an all-around wonderful and interesting dish! There are some awesome ingredients in there! What a beautiful meal you have there. Love the color too. Gosh, this must taste really good. Making curry paste… I don't know… perhaps you can make it and start a little mail-order business?!? And quit showing photos of your perfect kaffir lime tree. Those of us in certain inhospitable (winter) climates are very envious!